It’s a major milestone that goes well beyond students using a mouse and keyboard to record responses to test questions. “The shift to online testing has done more for the educational technology movement than any other single initiative,” said Doug Levin, president of EdTech Strategies, who wrote Pencils Down: The Shift to Online & Computer-Based Testing. That shift has required building “an infrastructure to support digital learning in schools and ensuring that kids have sufficient access,” he said, adding that there’s still “quite a ways to go” in terms of equity of access so students are learning from educators who effectively integrate technology into their teaching. Levin identified five reasons online testing offers “compelling advantages” over paper-and-pencil assessments. He wrote that they can better assess what students understand and how they perform; offer better accessibility for students with special needs; be administered more efficiently, and scored faster; and offer improved security and increased student motivation and engagement. By “improved security,” Levin explained that there is a decreased chance for cheating on computer-based tests. The Atlanta cheating scandal could not have happened in online assessments, he said. At the same time, other vulnerabilities arise in online testing, as evidenced in the problems that arose earlier this year with testing disruptions or difficulties in states from Florida to Minnesota, from Nevada to Montana and Wisconsin. “Testing companies have been fined millions of dollars, lost contracts, and [have] been embarrassed,” Levin said in an interview. On the other hand, if schools don’t have enough technology to support the testing, “whose responsibility is it to get what they need?” he asked. Some states take the position that it’s the local district’s responsibility to get the funding. “When there’s been insufficient planning, and insufficient resources, … to me, this bespeaks the notion of trying to do it on the cheap,” Levin said. Four testing companies—the American Institutes for Research (AIR), Educational Testing Service (ETS), Data Recognition Corp. (DRC), and Pearson—will deliver about three-quarters of the summative assessments in elementary and middle schools for the 2015-16 school year, the report said. These companies will administer most of the tests created for the two consortia—Smarter Balanced and the Partnership for Assessment of Readiness for College and Careers, or PARCC—that produced assessments to determine students’ mastery of common core state standards. 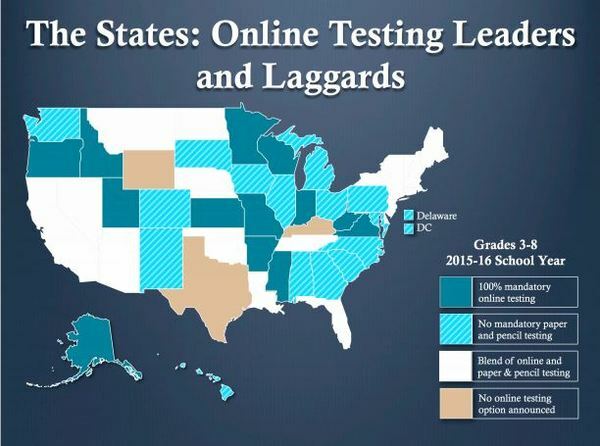 More than 10 states are launching new online tests with new vendors for 2015-16, which he said puts these states at a special risk of a technology-related issue in the administration of the tests. “In every instance where there was an issue last year, it was a new vendor with a new test,” Levin said. “New York is probably the one to watch,” as it gears up for a major roll-out of online testing, said Levin. Questar is the new vendor there, and in Mississippi. And the impact will be far-ranging. The “universe” of state-mandated assessments amounts to more than 800 distinct tests—as defined by grade level and subject matter. These will be given to about 20 million students in grades 3 through 8, according to Levin’s research, with most students taking between two and four mandated summative tests each year. English language arts and math are the two most common. Science is the subject that is most likely to be administered the old-fashioned way: pencil and paper, Levin found. This is one of the greatest boondoggles of all time, a never-ending source of profit for the testing and computer industry. It requires all students to have access to up-to-date computers. As we know, computers need to be replaced every three years because of "progress" in technology. It means that every time there is new "progress," we need to spend more money on the latest technology. There is no evidence that online testing is better than old-fashioned testing, no evidence that it produces more accurate and useful results. To my knowledge, there is currently no attempt to gather this kind of evidence. If the brave new online testing fails, teachers will be blamed, and there will be more money spent on technology and professional development. And the "professional development" will be about untested technology that will be obsolete by the time teachers master it. Your headline is abysmal — "Leaders and Laggards" — clearly implying that those who haven’t moved young children to computerized assessments are "laggards." Where is the research showing that all 3rd graders do as well on online assessments as they do on paper/pencil tests? Research has demonstrated that they don’t do well with answer sheets, so more research is required before we move them to computerized tests. A second issue, which people who don’t put their feet inside schools tend to ignore, is that every day computers are used for tests is a day they can’t be used for instruction. I know of schools in which no computers can be used for instruction for an entire month. This disrupts instruction in major ways for all classes, but it’s especially bad if you teach about computers and your students have no access to them for an entire month. Policy makers and pontificators need to spend some time in real schools, especially right before and during testing windows. This post is genuinely a nice one it helps new internet viewers, who are wisbing for blogging. late, bbut I never disccovered any attention-grabbing article like yours.